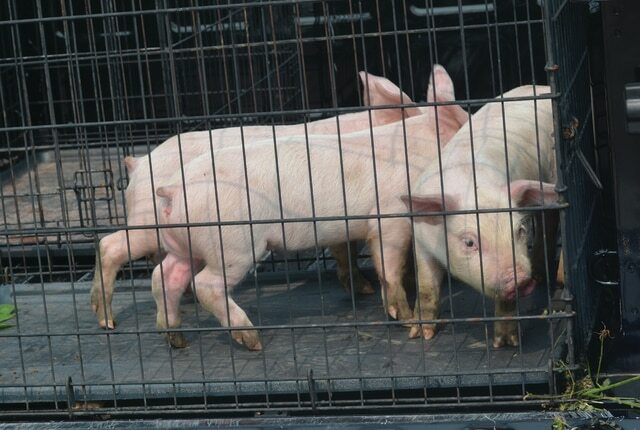 Greene County Sheriff’s deputies worked to capture several piglets Tuesday morning. XENIA — Recovery crews continued efforts Wednesday to corral piglets let loose in Xenia Township after a tractor-trailer crash Monday evening. Ohio Department of Natural Resources and U.S. Department of Agriculture crews were reportedly at the scene near the crash site Wednesday working to round up the remaining animals. As officials continue the recovery process, the Greene County Sheriff’s Office is reminding locals not to stop on roadways to try to capture the animals. “The most important thing is people are not to pull their cars off to the side of the road and catch the pigs,” Greene County Sheriff’s Sgt. Beth Prall said. “We had problems with that (Tuesday). They will be issued a citation for parking on a highway, because that is a road hazard for us, especially in that corner (of the westbound US Route 35 bypass). Hundreds of the swine were left wandering near and on the westbound lane of the US Route 35 bypass near the edge of Xenia after Terry Alley, the driver of a semi carrying 2,200 piglets, lost control of his truck. The impact from the accident damaged the trailer such that many of the animals escaped. A passenger in the truck was reportedly transported to a local hospital with minor injuries. Alley, of Lafayette, Ind., was cited for failure to maintain reasonable control, and has a court date set for June 12 in Xenia Municipal Court. Local crews worked throughout Monday night into Tuesday morning to clear the scene and re-capture the pigs. According to Xenia Township Fire Department Deputy Chief Greg Beegle, about 1,100 of the animals were transported early Tuesday morning to the Greene County Fairgrounds for temporary storage. Many of the animals were killed in the accident, but the exact number is unclear. An estimated number of the piglets still on the loose was unavailable Wednesday. Those seeing any of the animals still free should contact the Greene County Sheriff’s Office at 937-376-5111.